The United States' so-called War on Terror in Afghanistan and Iraq is perhaps only the most recent example of the many times in which the long arm of US military power has reached into Asia to protect its economic interests (as in the Gulf), increase its sphere influence (as in the Philippines), overcome enemy nations and ideologies (as in Vietnam) or exact national revenge (as in Afghanistan). However, it is perhaps interesting for students of Malay history to note that the United States' first-ever armed intervention in Asia was against Malay states in Sumatra. The military assault on 'Quallah Battoo' (Kuala Batu) in Sumatra was a US response to attacks by what were perhaps the most-feared 'terrorists' of the day - the Malay pirate fleets of the Straits of Melaka. In February 1831, an American merchant vessel, the Friendship, called on the harbour of Kuala Batu, on the Pedir coast of Sumatra. The ship was taking in a cargo of pepper when a Malay boat set off from the village, ostensibly to deliver part of the cargo. However, while the pepper was being carried aboard, the Malays, at a given signal, suddenly attacked the officers and crew. Owen Rutter, in his book "The Pirate Wind", said that every soul on board the vessel was killed in the raid and the pirates ransacked the ship, carrying off all its cargo and cash to the value of 8,000 dollars. Fortunately, the captain of the Friendship, Charles M Endicott, had been ashore with four of his men. Returning to his ship and finding his crew dead, cargo missing and his ship in shambles, he fled the area and sought the aid of other American cargo ships that were trading along the Pedir coast. These ships assembled at Kuala Batu and sent a message to the local chieftain demanding the punishment of the robbers and return or restitution of all property seized or damaged. However, the local chieftain - recorded as a certain 'Mahomet' - denied all knowledge of the attack. He had, in fact, added insult to injury by putting a price on the head of Captain Endicott and any of his officers and seamen who may have escaped the raid. The American ships returned to their base port in Salem, Massachusetts, to report the incident to the authorities. 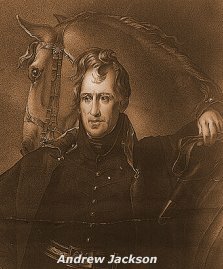 The then President of the United States, Andrew Jackson, promised swift retribution. In his third State of Nation speech in December that year, he told the Senate and House of Representatives that "a daring outrage" had been committed in the seas of the East Indies involving the "plunder" of one of its merchant-men engaged in the pepper trade at a port in Sumatra. 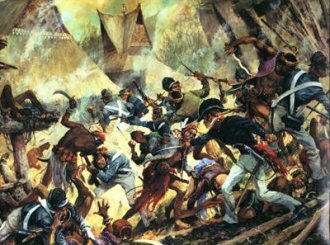 There appeared to be no room for diplomatic action as Jackson believed that "the piratical perpetrators belonged to tribes in such a state of society that the usual course of proceedings between civilized nations cannot be pursued. I forthwith dispatched a frigate with orders to require immediate satisfaction for the injury and indemnity to the sufferers." Jackson believed that if those who committed this " act of atrocious piracy" were found to be "members of a regular government, capable of maintaining the usual relations with foreign nations", satisfaction could be negotiated. However, if they were to be "a band of lawless pirates", the frigate had orders to "inflict chastisement". The vessel selected to inflict this "chastisement" was the 'Potomac' - a navy frigate built at the Washington navy Yard in 1822 equipped with forty-two 32-pounder guns. Its commanding officer was a Commodore John Downes and this expedition was its first overseas cruise. It carried with it a combined force of over 300 armed Navy 'blue-jackets' and US marines. The Potomac left Sandy Hook, New York, on August 28th, 1831, and set off on what was to become the United States' first-ever official military intervention in Asia. In the early morning of February, 7th, Downes sent first Lieutenant, Alvin Edson, with a detachment of marines and three detachments of sea men, with orders to attack and take by storm a group of four Malay forts along the coast. The landing party of 282 men rowed ashore and deployed their forces into three parties. One party attacked the first Malay strong hold, blew up the stockade gate and met the Malays in fierce hand-to-hand combat. It was reported that all the Malays fought to the death before the stockade was overcome - the spears, ancient flintlock muskets and earth and wood fortifications of the Malays were no match for the rapid, long-range and overpowering firepower of modern Western rifles and forty-two 30-pounder cannons. One by one, the three other fortresses were captured during five hours of bitter fighting. Over 150 of the Malay pirates, including Mahomet were killed in attacks, while 2 American sea men were killed and 11 wounded. On February 9th, the men returned to the Potomac and the vessel proceeded to bombard the village itself, its cannons setting fire to and destroying the village - and killing over 300 of its inhabitants. However, this 'chastisement' was very quickly forgotten by the Malays just seven years later when in August 1838, in the same area, the U.S merchant ship 'Eclipse', commanded by Captain Wilkins, suffered the same fate as the Friendship. While trading at a village called Trabongan, near the town of Muka, she was visited by a party of 24 Malays, who asked permission to come aboard. Wilkins was wracked with fever in his cabin, but his second mate allowed them on deck, asking them to surrender their arms before boarding. This they did without complain. However, when the Captain appeared on deck to receive them, the chief of the party complained and asked that their weapons be given back to them as a mark of good faith. Wilkins agreed to this request and the Malays were returned their krises. Minutes later, Wilkins was stabbed and killed. His second mate was stabbed as well, but saved himself by leaping overboard. Several members of the crew followed him while others climbed up the rigging to save themselves. The pirates then began to plunder the ship, carrying away with them four chests of opium and 18 thousand Spanish dollars. News of this second outrage reached Commodore Read of the US frigate Columbine at Ceylon. He sailed with his quadrant for Kuala Batu and demanded a surrender of the pirates and the property in their possession. When he received no response, he promptly bombarded the town. He then sailed for Muka where he landed a party of 30 officers and 300 men. Within hours Muka was ablaze and its inhabitant scattered to the surrounding jungles. The first American traders had arrived in Sumatra at the end of the 18th century and from then until 1860 it's estimated that American ships based largely in Salem made nearly a 1000 voyages, carrying away 370 million pounds of pepper, worth 17 million dollars - almost half the pepper produced in Acheh during this period. In fact, low operation costs and faster ships enabled American traders to compete with the British and Dutch in the pepper trade, which was a matter of concern to the two colonial powers. The then Sultan of Acheh, Sultan Muhammed Shah (1823-38) was under pressure by both the Dutch and the British to check this American trade and the Achinese had on occasion detained American ships on alleged violation of British or Dutch trading laws. A treaty signed with Acheh in 1819 with the British actually included an undertaking to exclude American powers from Acheh. It is therefore unclear just how much of this piracy on American ships was pure robbery and just how much of it was actually the colonial power games of the period. It cannot be denied though that the waters of the straits were indeed infested by Malay pirates at the time. Referred to as the 'Vikings of the East', no trading ships were safe from these sea-raiders. They could shelter in a thousand lonely bays or a thousand hidden rivers along the coast of the Malay Peninsula and Sumatra, only to sweep out to open sea in swarms of up to 50 fast prahus and overwhelm the slow, heavy sail ships of the East India merchant men. The pirate prahus were fast and nimble, using both oars and light sails and were frequently armed with a few small swivel guns. Dressed in scarlet and coats of chain-mail, brandishing krises, two-handed swords and flint locks, the pirates either murdered every soul on board or sold the survivors to slavery. However, the situation was to change dramatically in 1836 with the arrival in the Straits of HMS Diana - the Royal Navy's first steam-driven gunship in the East Indies This fast moving vessel - and those that followed it - could out manoeuvre and outrun the pirate prahus, especially upwind, while decimating the Malay ranks with its arsenal of long-range high-calibre cannon and rapid rifle fire from the armed sea men onboard. While there were still many instances of piracy, the new military technology of the West ensured it no longer became the dreaded scourge and terror that it was centuries before. With regard to the Potomac, after its sacking of Kuala Batu, it proceeded to do an official tour circumnavigating the world, also becoming the first US Navy ship to play host to royalty - the King and Queen of the Sandwich Islands (i.e.Hawaii). It finally returned to Boston in June 1834. Its voyage around the world became the subject of a book, 'Voyage of the United States Frigate Potomac', by Downes' private secretary Jeremiah N Reynolds. The Kuala Batu incident itself formed part of the basis of an American novel published in 1901 by a Kirk Munroe. Called "A Son of Satsuma", it is an interesting mingling of fiction and fact, with the book's main protagonist Bob Whiting finding himself stranded in Sumatra when his ship, the Friendship, is captured by local pirates. He meets a 'Malay with gray eyes' and observes life in the pepper fields of Sumatra before he makes his final dash for freedom and is rescued by the Potomac and "Uncle Sam's long arm". The book ends with Whiting in Japan, making arrangements for his trusty Japanese sidekick, Kato, to join the US Naval Academy! The assault on "Quallah Battoo" is celebrated in US Marine Corps annals, but little is mentioned of it elsewhere. 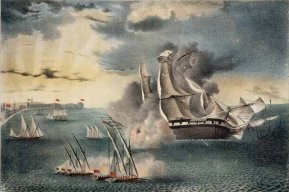 While significant as being America's first military action in Asia, Downes' exploits were perhaps not as renowned and celebrated in US military annals as the earlier naval exploits of Stephen Decatur against the pirates of the Barbary coast at Tripoli in Libya. Then again, if one were to change the opening lines of the US Marines hymn to "From the halls of Montezuma, to the shores of Quallah Batoo..." - it perhaps might not have quite the same ring to it. 'Voyage of the United States Frigate Potomac', Jeremiah N Reynolds. New York: Harper and Brothers, 1835. 'A Son of Satsuma', Kirk Munroe. New York: Scribners, 1901. 'The Pirate Wind: Tales of the Sea-Robbers of Malaya', Owen Rutter. Hutchinson & Co. Ltd (1930), issued as Oxford University Press paperback 1986.